Adder’s tongue fern scientifically known as Ophioglossum vulgatum is a perennial herbaceous plant belonging to the family of Ophioglossaceae. The plant is native to the tropical Africa and throughout the temperate Northern Hemisphere in Europe, northeastern North America, temperate Asia, and Eurasia. Some of the popular common names of the plant are Adder’s tongue fern, common adder’s tongue, English adder’s tongue, snake’s tongue, viper’s tongue, serpent’s tongue, adder’s-tongue fern, southern adder’s tongue, adder’s spear, Christ’s spear. The name Ophioglossum comes from the Greek ophios (serpent), and glossa (tongue). 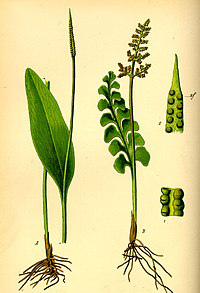 Adder’s tongue fern is a small, terrestrial, herbaceous, perennial plant that grows about 3–6 inches (8–15 cm) tall. The plant is found growing in grasslands and meadows, on hillsides, along woodland rides, sand dunes, un-improved pastures, old damp meadows, rock crevices and grassy path-sides but also occurs in colonies of hundreds of plants in sand dune slacks. It prefers sunny or sometimes slightly shaded areas on damp to wet, nutrient-poor, not or little fertilized, weakly acidic to neutral soil. It is also found in places where the water is weak (dune sand, calcareous loam or peat). The perennial adder’s tongues are so named because the spore-bearing stalk resembles a snake’s tongue. It has no resemblance to any other fern, and has much the appearance of a small arum flower. Each plant has an erect, leafless stem that is 2-15 cm high and which branches into a single leaf-like, ascending, sterile blade and into an erect, spike-like fertile stalk. The sterile blade is elliptic to broadly lance-shaped and 2-8 cm long with entire margins and a rounded to pointed tip. The upper portion of the fertile stalk has 2 rows of contiguous spore-bearing sacs on one side. 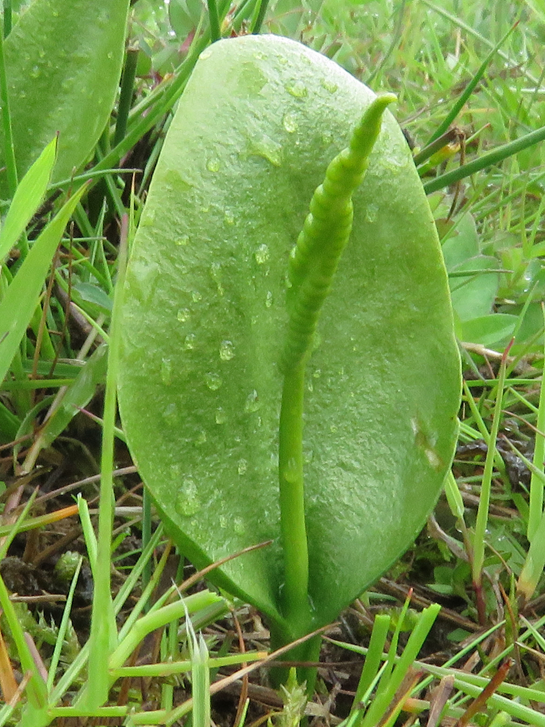 Adder’s Tongue produces no flowers, but reproduces via spores on the spike that emerges from the single leaf. The plant part of the herb is actually underground, and it does not send up a leaf and spike every year. This means that years can pass without it being seen, but under the soil, the plant is there! The name Ophioglossum comes from the Greek ophios (serpent), and glossa (tongue). Medieval herbalists called it “a fine cooling herb,” but if anyone picking the hard-to-find herb risked being followed by snakes. In witchcraft, the herb’s use is said to stop slander and gossip. Adder’s-spear ointment was sold by apothecaries from the 18th century. 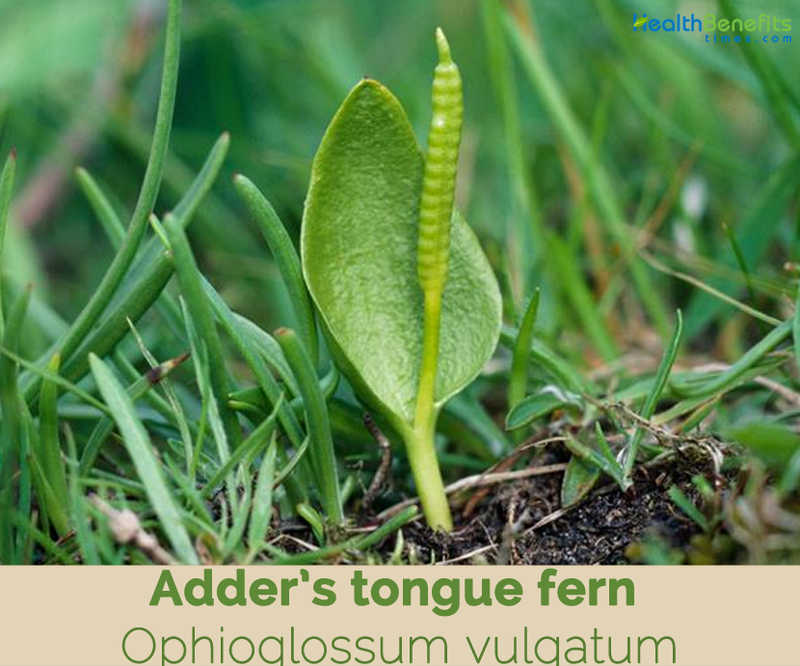 Adder’s tongue was a popular treatment for scrofula, a form of tuberculosis that affects the lymph nodes in the neck, and it is still used by herbalists for skin ailments. The name “Christ’s spear” comes from its appearance, and the fact that Jesus’ side was pierced by a spear. Therefore, according to Paracelsus’s 16th-century Doctrine of Signatures the plant was used to cure wounds. In flower language it is a symbol of jealousy. Leaves and rhizomes have been used across Europe as a poultice for wounds. Fresh leaves make an effective and comforting poultice for ulcers and tumors. Juice of the leaves, drunk alone, or with distilled water of horsetail, used to be popular for internal wounds and bruises. Distilled water was also considered good for sore eyes. Juice of the leaves drank with distilled water of Horse-tail is good for relieving hiccough, and for vomiting, or bleeding at the mouth or nose. For ruptures or burst bellies, take as much of the powder of the dried leaves as will lie on a sixpence, or less, according to the age of the patient, in two ounces of horse-tail or oak-bud water, sweetened with syrup of quinces. Root and the leaves are antiseptic, detergent, emetic, haemostatic, styptic and vulnerary. An ointment made from the plant is considered to be a good remedy for wounds and is also used in the treatment of skin ulcers. Expressed juice of the leaves is drunk as a treatment for internal bleeding and bruising. Warm decoction of the rhizome is used topically on boils. Leaf juice is drunk against spasms of the heart. Leaves, boiled in oil, are applied to wounds. 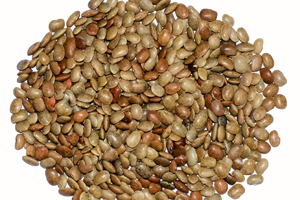 Plant is used as an anti-inflammatory medicine. Tea made from the leaves was used as a traditional European folk remedy for internal bleeding and vomiting. Leaves are used as a vegetable. Young fronds are commonly eaten as a salad or vegetable. Leaves should be blanched only; if boiled too much they turn into slime. Salve was made to massage into the blocked or inflamed udders of cows. It reproduces by means of spores. In flower language it is a symbol of jealousy. Small children and pregnant women should use additional caution when considering the use of herbal remedies. Ophioglossum polyphyllum A. Braun ex Schub. Ophioglossum pringlei Underw. ex Conz. Ophioglossum vulgatum var. valdivianum Licht.